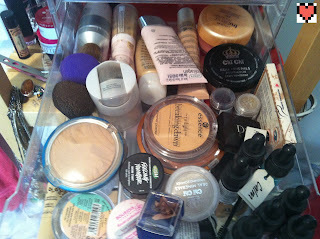 I always enjoy seeing how other people deal with storing/handling their makeup stash, therefore since i have recently reached what i feel might be the zenith of what one of my drawers can hold it seemed like a good time to share. 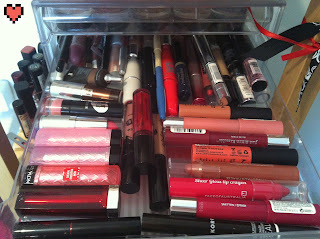 My makeup used to fit into my side of the bathroom cabinet but shortly before i started blogging my collection was...overflowing into my boyfriends side of things, so after doing a bit of research i picked up a clear plastic set of drawers from Officeworks, i believe it cost around $20 and also came in white. 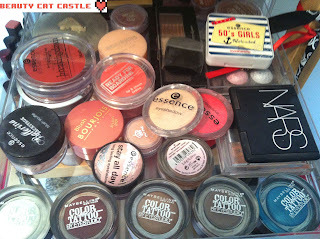 There is also a Australis red eyeshadows set underneath the Revlon. Drawer 3 is th one that I'm looking to change up, my house and bathroom is quite tiny so I've been trying to think up a better way to store these. 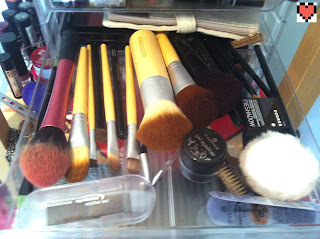 For now however my brushes and random nick-nacks live here. Lastly we have th Foundation and Powder drawer that also takes whatever is too weird a size for the other drawers. 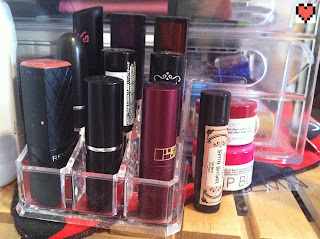 Annnnnnd..... last but not least is my main lipstick stand and my lip balms next to the case. The one i currently use the most; Lancome Rose Defile, Revlon Soft Rose, Lipstick Queen Medieval, NYX Saturn and Tea rose, Mac Creme de la Femme, Rimmel 21, and two random Revlon colors in caramel and plum. The lip balms sitting there are Haus if Gloi Spun Sugar and Korres Quince and Wild Rose. 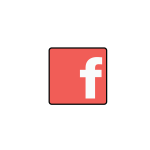 o if you see anything you wanna know more about drop a comment, or if you have another cool storage post/video i would love to see it! Love storage posts!!! That's a very impressive collection you've got there! 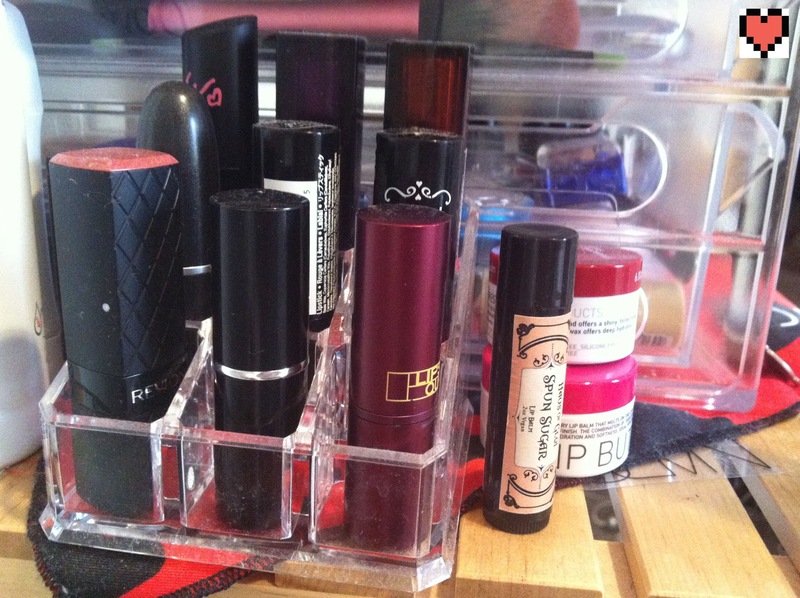 I store mine in little plastic drawers I got from kmart, but I might have to pick some officeworks ones up next, as mine's overflowing too! I have to store my lippies and blush in empty bellaboxes that I've placed on the keyboard drawer (my "makeup" table is an ex-computer table).